In fact I have not yet read the full version of the following series, my english＞﹏＜ so pity. Can anyone tell me is it really a completely ending? I am currently reading the 1st book (Project Nemesis) and already enjoying it and looking forward to the future novels. 1: What is the name of that supersized monster with all the tentacles? She (he?) is HUGE! 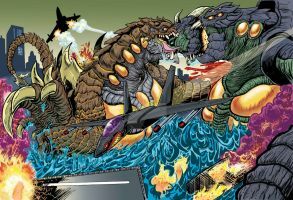 2: How would this super kaiju fair against Godzilla (2014 version or Final Wars version)? This shark can't read the full text, but got descriptions from the author. 2. Wait, Ghidorah+Mothra+Rodan like kaijus = that super kaiju! In Ghidorah's 1st appearance, Godzilla needed help from Rodan and Mothra to fight Ghidorah. For that Mamajama kaiju to be that much of a chimera, shudders, would be such an powerful force that Nemesis would need plenty of help. Kaiju-Sized Props to You on This, Man! Good gravy! This is EPIC! This is an awesome book cover art. It sort of a reminiscent of Godzilla Vs Biollante and of other Godzilla movie poster from the 90s made by Noriyoshi Ohrai. Alright! The fifth book! I've been waiting for this one for a while now! I just finished Project Hyperion, I'm so excited!!! what's the name of the big one? It was called Mamajama, really! haha. I guess Hudson is too occupied in destroying it to give it a proper name, like "Aegis" or "Fin"
No, it has a proper name. I don't want to spoil too much, but that's more or less what it is. Hmm. Never watched Ultraman, so I didn't know that. That said, it is an ultra kaiju... as in it's super-powerful and extremely dangerous. So Awesome! I need this book. This is just simply EPIC!! The art is amazing!! I love the Battle scene!! The Giant Monster that Nemesis is facing looks really incredible, I love it's design! !